Now that we are about a month into the new year, I thought I would take a moment to highlight some of the fun things we’ve done so far. We love working with all of our clients and there’s never a dull moment! Whether we are filing patent,trademark and copyright applications, enforcing patents and trademarks or consulting on an intellectual property matter, it’s our privilege and pleasure to be a part of your dream and team! Many of you are already enjoying our pictures and Instagram stories! Thank you! If not, take a minute to like and comment on our pictures at www.instagram.com/evansiplaw. How are you enjoying our new website? We made it even easier to subscribe to our Firm’s newsletter and we even added a MEDIA page! 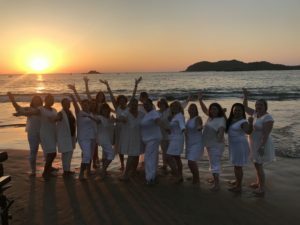 I recently had a wonderful time attending the INDIE CRUISE in Ixtapa, Mexico! This was a perfect way to start 2018- with a little bit of business, pleasure and relaxation. I learned so much and I had a great time networking and getting to know several of my clients better. Here’s a picture of me with the group enjoying sunset in Ixtapa! To me, this pictures captures the essence of the trip- friendship, restoration and expansion. How’s 2018 going for you so far?